Can there possibly be a building type more cuddly and unthreatening than a cottage? Aye, but the density NIMBY’s of single-family Seattle are sensitive bunch, and the thought of cottages in their neighborhoods sends them into convulsions of fear. 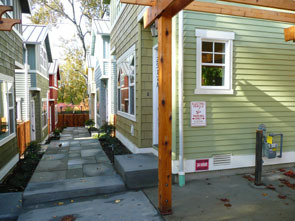 Galvanized by the 1991 award-winning renovation of the Pine Street Cottages (shown above), the City of Seattle crafted a cottage housing ordinance in the mid-1990s. But neighborhood groups vehemently opposed allowing any such scary scary cottages into their precious single-family zones, and as a result the ordinance was only adopted for multi-family zones. 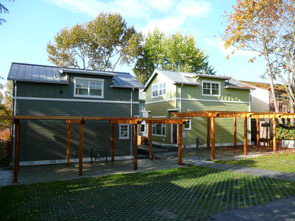 The implementation of the Kirkland cottage housing ordinance was greatly facilitated by a demonstration project known as Danielson Grove (photo above), designed by Russ Chapin Architects. This project was so well done that pretty much everybody who sees it loves it: The burden of the density advocates in action. 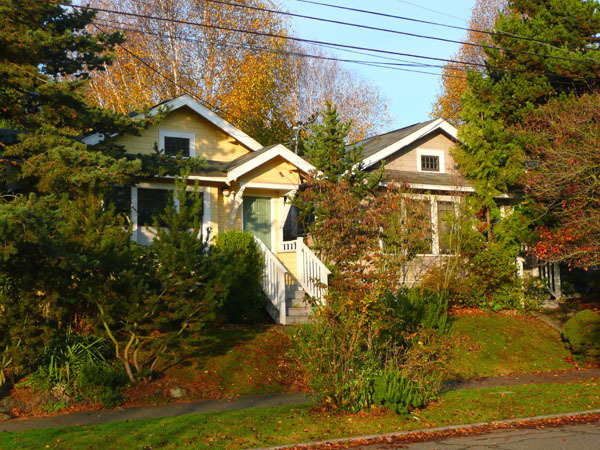 A decade or so ago the City of Seattle permitted two cottage housing demonstration projects in single-family zones, Ravenna Cottages and Jefferson Cottages. Other cottage projects have been built, but are located in multifamily zones — Boulders and Ashworth Cottages for example. The photos below show a brand new cottage development that I stumbled across the other day: Mount Baker Cottages. I don’t know how this thing got permitted — it’s located in a single-family zone. There are six very tightly spaced cottages tucked into the back portion of a single-family lot. So OK then, even though Seattle has several attractive and well-liked examples of cottage development, unfortunately it seems they are not enough like baby bunnies to ease the distress of a city gripped by the terror of the scary scary cottages. Posted by dan bertolet on	Saturday, November 29th, 2008 at 12:17 am. You can follow any responses to this entry through the RSS 2.0 feed. You can leave a response, or trackback from your own site. Take out the word cottage and put in the word townhouse and you could make exactly the same argument, with exactly the same amount of sarcasm. The underlying argument for both cottages and townhouses is the same and it sounds quite reasonable: this is a way of doing density that still protects the character of single family zones. Unfortunately, this misses the point. It’s not about character whatever that means. It’s about stopping development of any kind. The economics is pretty simple: unless a person is very, very wealthy, it is far too expensive to buy a single family house, tear it down and build another single family house in its place. Of course this does happen sometimes and you can be sure that the NIMBYs are just as vehemently opposed to that (see the monster house debate). Back to cottages though, it is very economically feasible to buy up one single family house, tear it down and build four units in its place. That kind of development pencils out and if it were allowed, we would start seeing a whole lot of it. Just look at the townhouse boom, and that was limited to multifamily zones. Essentially, the demand for housing in Seattle is so high, that one crack in the single family dike will likely result in a massive raising and redeveloping of entire neighborhoods. Density is profitable, no profit, no development, that’s what it’s about. Now why exactly is there such a strong resistance to development in this city? It has to do with decades upon decades of mistrust that have built up between the city and its citizens. While there are plenty of good developers out there and you can point to several examples like the ones above, there are also a lot of bad ones out there, and as far as most neighbors are concerned, it’s a lot easier to point to bad development than it is to point to good development. Citizens have come to believe that no matter how well intentioned new density is, developers will find some way to mess it up. The belief is that developers simply cannot be trusted and the city cannot be trusted to regulate them. Because there is no trust, the fallback is what we know we can rely on: single family zoning, not because they love single family houses, but because they can’t trust anything else. If the city can find a way to get a handle on its multifamily zones. If it can find a way to ensure that we have nothing but great architecture in our urban villages, and if it can do so consistently for along period of time, then people may start to relax and be open to considering opening the door to SF zones, but so long as developers build garbage, and a the city continues to allow it, then why on earth would you expect us to open the door and let the enemy into the last beautiful places in the city? Not sure if it’s SF or MF zoning, though. There is a cottage development right next to my apartment building on Capitol Hill that I have been trying to find info on forever. It’s never mentioned in any articles about cottage developments, and I can’t find anything about them online, there are 8 of them, two on the street with 3 more rows of 2 going back. You can’t see them at all on Google Street view, but the approximate address that it gives for them is 716 Summit Ave E, all you can see is the fence in front of them. They have definitely been there for a while, at least 20 years by the looks of them. Anyone know anything about them? Tony, I agree with much of what you say, but I think you let the density NIMBYs off the hook too easily. Increasing density in cities like Seattle is a critical strategy for addressing climate change, resource depletion, and ecological collapse. It’s about much more than whether or not people in single-family zones think new development is up to their standards of beauty. This is an equity issue, on a planetary scale. I think your view that density NIMBYs would have no problem with density as long as it looked good is dubious. The most common arguments against density are about parking and traffic. But even if it’s a problem of quality as you claim, pointing fingers at developers or the city seems to be an awfully convenient excuse. If new development is required to satisfy the whims of every single-family home owner, nothing will ever be built. Any change is always going to upset someone. Furthermore, when people stop buying garbage, developers will stop building it. The ugly townhouse problem is a reflection of cultural issues much deeper than developers trying to make money. It comes down to what you believe is the appropriate level of response to our current crises. As I see reality, there is very little time left for coddling people who oppose density. Tony, do you really think we can afford your “long period of time”? The most common arguments against density are about parking and traffic. This is what works because our infra is cr*p and no alternatives to cars exist. Second, houses are the main investment vehicle for most (as well as the main dream vehicle – that is: my identity is = “The American Dream” and because I have a house, I Am Somebody Now). Arguments are easily made that density results in diminished value – are they true? Well, are they? Sometimes. the demand for housing in Seattle is so high, that one crack in the single family dike will likely result in a massive [razing] and redeveloping of entire neighborhoods. Riiight. Here come the Soviets, tearing down Patriot-American’s homes and putting up faceless concrete blocks for the apparatchik to live in . Certainly market demand can jack up land rents so high in all cities that folks can’t afford the property tax. This will result in politicians lowering taxes, not razing homes. The point here is that by 2050, 1/2 of American built environments will have been built since 2000. Where is all this stuff gonna go? Cites don’t want to extend far-flung infra. So it has to go to vacant land, infill, more people per HH. People will wake up eventually. Will it be tomorrow? No. So we’ll have continued arguing for a generation (my glass is half-full, but half-full of groundwater tainted by industrial ag.). Dan, I think the Ashworth cottages were actually in an SF 5000 zone that got a council-approved spot rezone for the cottage project. The previous use of the space had been a warehouse, so the rezone was probably politically easier than it would have been had the previous use been housing. Nonetheless, it wasn’t a multi-family zone, and there was political work to get it approved. In fact, I think Steinbrueck mentioned that he thought the design was about the best you could do with the parcel. I checked out the Ashworth “Cottages” because I currently live in a cottage setting on Cherry Hill and I’m a huge fan of the concept. The Ashworth development is massive– those are single family homes that happened to be clustered together. My cottage is 450 sq feet, built in the early 20th century. Part of the charm is the wee size and the attendant scale of resources. For a single family, 1000 feet would be reasonable, but “2000 sq. ft.” is not a cottage. The rest of the country is beginning to fall in love with the cottage development idea– just enough space, front porches, communal areas, petite garden spaces. It would be a shame if Seattle missed out on this very Seattle-y movement due to shortsightedness. Why are development issues so difficult for us to figure out? Doesn’t increased density in Seattle just make the suburbs and building in the suburbs more affordable, attracting more people to the region? Or is there a law that withdraws suburban or rural land from potential development with every unit of in-city housing that we build, or every mature tree we eliminate? Is Suncadia any smaller due to the myriad 6-packs gracing Seattle? 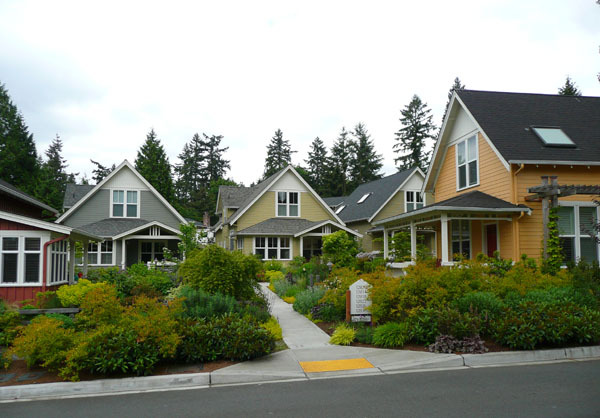 Why is it better, as far as future food security is concerned, to build townhouses in Seattle’s SF zones rather than in Walla Walla, Bellingham, or Clarkston? Ok, never mind the cottages… that Google Streetview has just blown my mind. 1. Regarding “design of townhouses”: for all of you who missed the AIA Doing Density Right workshop a few months back, the arcane combination of setback distances, parking requirements, and hodgepodge of design requirements that govern this bizarre class of buildings makes it nearly impossible to make anything attractive and affordable. We need to create more flexible alternatives to code and get over the pseudo craftsman cookie cutter aesthetic. 2. @9, urban infill housing is a much better buy (even at a higher price) when one considers the cost of transportation, travel time, and access to amenities. E.G. a $500,000 condo with a 15 minute walking commute costs you about the same as a 300,000 house in Maple Valley where you spend an extra hour on the roads. Oh yeah, and you also get exercise and meet your neighbors and so on. . . The point is that by expanding opportunities within the urbanized areas, we remove structural demand for housing on farmland and in small suburban towns that don’t have the infrastructure to support it. If Walla Walla or Bellingham has the employment base and amenities that Seattle has, then by all means, we should build rowhouses there. Do we have the infrastructure to support more density without further harm to the Sound? @9, 11, 12. The issue as I see it regards accessibility of sprawl. In a city, the you are geographically restrained in a way that encourages density. The amount of land within a walkable distance to the desirable areas is small, so it makes sense to build up. This is the case to a decreasing extent as you travel further from the city center. The end result is that anything within, say, 10 miles of the center has a much higher density than a house in, say, Walla Walla. But in a brief answer to your question //why is it better to build townhouses in Seattle compared to Walla Walla//, well, other than minor transportation efficiency reasons it isn’t. The problem is that land isn’t as scarce of a resource there, so it’s tough to convince people to actually do this.